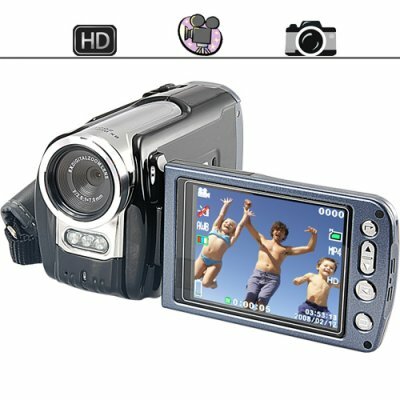 Successfully Added HD Camcorder - High Definition Digital Video Camera (Black) to your Shopping Cart. HD camcorder for those of us who want a high level hi-def digital video camera, but want to buy it at a direct from the factory budget price. Having a 3 inch flip out LCD view screen and 720P resolution, this unit will have you easily making high quality videos in no time, and with its native HDMI output port you can watch the videos directly on your HDTV. With this HD camcorder your personally made videos will be clearer than you ever imagined, so whether you are a youtube enthusiast, citizen journalist, or budding cinematographer, your vids will look just as good as any big budget Hollywood movie! If you are buying this for your next family trip, the high resolution video camera will make all the scenery shots dazzling to behold, while also giving you the ability to shoot high megapixel still images (up to 12MP). Having a high capacity SD card slot (up to 16GB) and Li-ion battery, you will have plenty of capacity to store all your favorite moments, while at the same time being able to easily hot swap memory cards and batteries as the day goes on. A super low priced way to make your own pro style movies and videos at a family friendly budget price, in stock and available for individual or bulk stock orders now. From the leader in direct from China electronics, Chinavasion. The kit includes everything you need to get started - camera, battery, charger, carrying bag, USB and AV cables. All that you need to provide is an SD card and your enthusiasm! Primary Function: Budget Friendly HD Camcorder. The DV camera for the average guy. Has audio only sound recording function. The microphone is located at the front of the camcorder. TV OUT feature (AV or HDMI) allows you to watch your videos and look at your pictures directly on your big screen TV. A great way to share your holiday videos with the whole family! The included evaluation video and photo editing software has limited functionality and comes with no support from Chinavasion. We recommend you download and use one of these free full featured video and photo editing software options - microsoft movie maker, apple imovie, avid freedv, wax, virtual dub, paint.net, gimp. All can be easily found on the internet, come in multiple languages, have active user communities, and will work with all computers including windows, mac, and linux systems. Yes, the unit has a built in screw-slot to attach to a standard tripod mount. Can I use this as a normal digital camera? Yes, this product makes an excellent picture camera for taking digital photos. Is this camcorder compatible with my Mac (or Linux) computer? Yes, for USB file transfer it is compatible with most computer types. However the included software is only for Windows PC's. What type of software is included with this DV camera? The included CD has Presto! Videoworks and Presto! Mr. Photo. This is basic starter software. If you become more interested in editing your videos or photos then open source choices such as Gimp will suit you much better. In addition, open-source software usually have better language choices than what is included with the camera.